A prediction model that better enables research scientists to compute the future melt of glaciers; taking climate change into account, is the result of a three year research project conducted by research scientist at the Institute of Earth Sciences in collaboration with domestic and international institutes and companies. The model will also prove useful to the Icelandic National Power Company (Landsvirkjun) for planning hydropower production, and furthermore for issuing flood warnings. The project is called SAMAR, and it has received funding from the Icelandic Centre for Research, Rannís. The main aim of the project SAMAR is to improve the predictive capabilities of surface energy balance models applied to estimate glacier melt. Guðfinna Aðalgeirsdóttir, professor in glaciology and her research team has developed a model, in collaboration with scientists at the Danish Meteorological Institute (DMI), that simulates the energy balance at the surface of Icelandic glaciers and estimates annual surface ablation for the period 1980-2016. The model has been operated on short time scales (days and weeks) to predict runoff from short-term forecasts. It has also been operated on decadal-scale for improved projections of the contribution of glaciers to sea level rise in warming climate. One of the factors that controls how much ice melts at a given time is the surface albedo which is highly variable on Icelandic glaciers; when snow changes to ice. Dust, sand and volcanic ash from eruptions precipitates onto the glaciers effecting the surface albedo and thus the glacier melt. It was due to this that the research team sought collaboration with two teams outside the University. 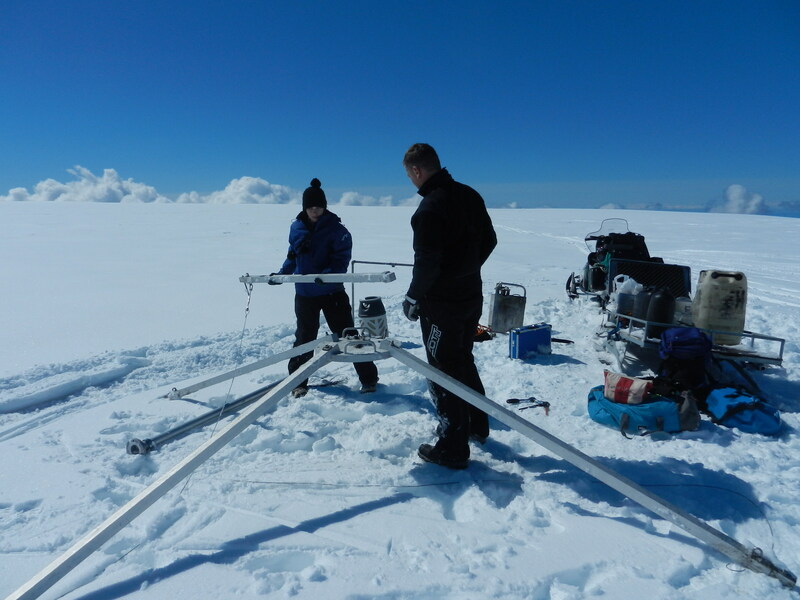 A domestic team that focused on the impact of dust and ashes on the glacier albedo. The second team; a collaboration with a French scientist at the University of Toulouse, used MODIS satellite data to create a time evolution of the albedo of Vatnajökull for the period 2001-2012. The project‘s outputs are, among other things, the time evolution of the albedo of Vatnajökull and simulations of the ablation of Icelandic glaciers for the period 1980-2016. The model developed in the project will be able to simulate the ablation further back in time, as well as estimate the future melt, as soon as the boundary conditions from climate models with given climate scenarios are in place. This the first time it is possible to validate and improve climate models for glacier ablation. This is because the data on in-situ surface mass balance of glaciers, along with measurements from automatic weather stations, from the last twenty years in Iceland, are the best of its kind in the world. The results are of international relevance as improved models will estimate with more precision the future contribution of Icelandic glaciers, and the Greenland Ice Sheet, to rising sea levels. The SAMAR project has been conducted in close collaboration between the UI's Institute of Earth Sciences, the Danish and Icelandic Meteorological Institutes, the University of Toulouse in France, and the Icelandic National Power Company. The Power Company will utilize the project results to improve the short term predictions of glacier melt, which is important for planning hydropower production, as well as being useful in issuing flood warnings.